and you’ll see an iconic attention-grabber… a national flag, including Chile‘s…from every country around the world. The first grade team at this school is helping children achieve early global awareness with activities that connect to their language arts, science and social studies curricula. Jayne Toole, substitute teacher, reviews student work. a substitute on a day the teacher needed to be absent. Jayne told me that the teacher she was “subbing” for left instructions for helping children complete a fact sheet based on what they had learned about Argentina. No muss, no fuss and good student focus with this activity, Jayne recalled. 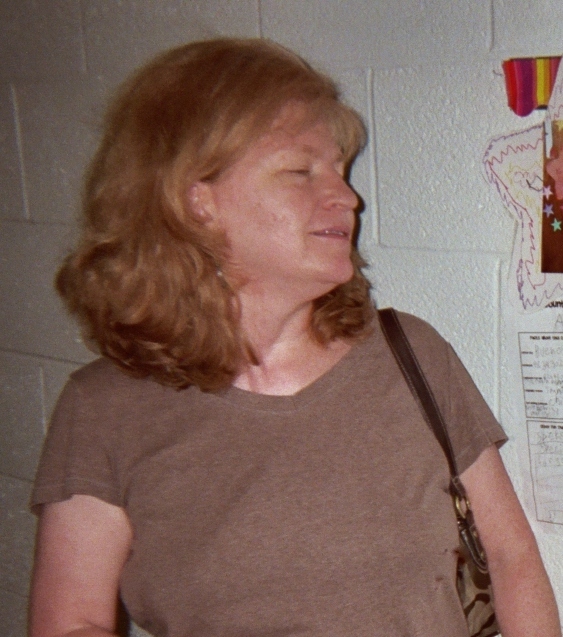 Jayne is standing by one of her student’s work (next blog pic below). The class traveled through basic research (and imagination) to Argentina. 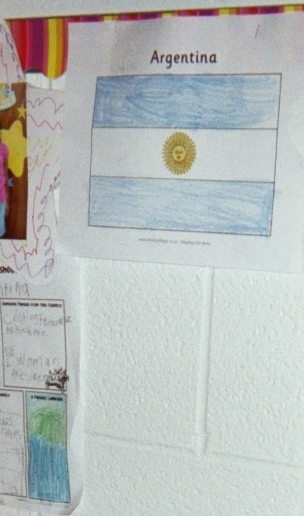 They learned to identify the Argentinian flag and appropriately color a printed outline of that nation’s proud symbol. What a great way to introduce the world to early learners! You may already have access to flag prints but if not, check out the online resource these teachers selected: www.ActivityVillage.co.uk-Keeping Kids Busy. It may be hard to see in my blog pics here, but the top of the country fact sheet has space for each student to write in the name of the country they’re studying. Further down, one side of the sheet offers room for students to write in the name of the capital city, the population, a brief description of the natural landscape and names of surrounding countries. Another part of the fact sheet leaves space for kids to write about someone famous from the focus country. The little girl whose work is shown above chose to feature the first elected woman president of Argentina, Cristina Fernandez de Kirchner. The box spaces at the bottom of the fact sheet invite students to record other fun things about the featured country and to draw a famous landmark there. Speaking of fun, I’ve discovered that K – 5 children love to tell about where they and members of their families have traveled. I’ve noticed that all of the schools where I teach are now global school communities because of population, if not curriculum. 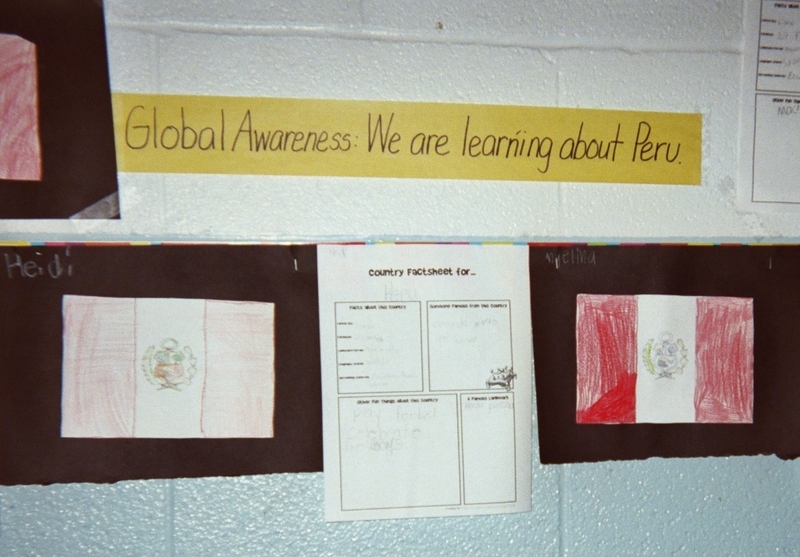 Global Awareness poster reads, "We are learning about Peru." Let’s call it “Star Students – Star Countries in the Global Community.” It’s an opportunity to teach kids about countries and also create another eye-catching bulletin board. 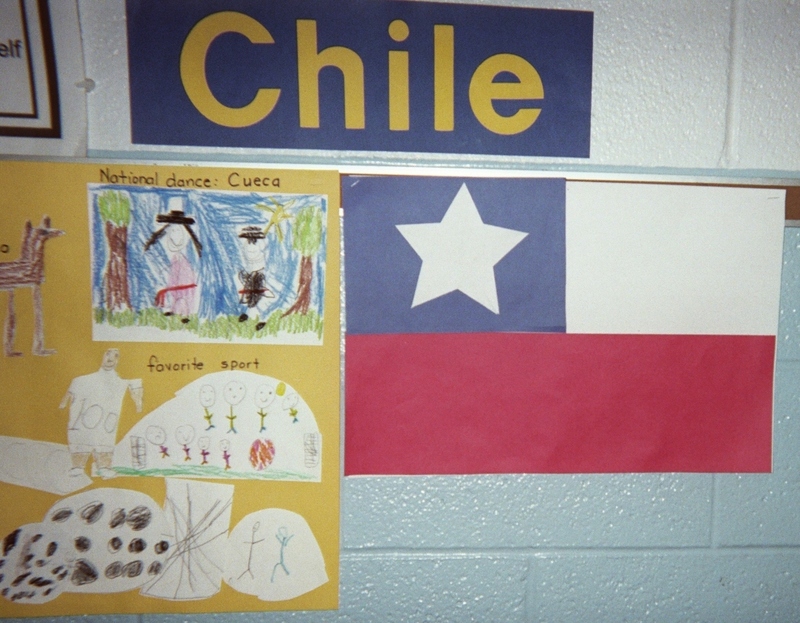 This activity can help children learn to recognize the flags of nations, like Peru, that connect with a social studies lesson. Added bonus: Build children’s pride in their personal heritage by inviting them to learn, draw, color, and/or cut out the flag of their native country. Post the class flag collection with corresponding student photos glued to pre-cut stars on a colorful bulletin board outside your classroom. Look online or in school supply stores for a bulletin board border that features illustrations of children dressed in native costumes from around the world, like you see in my next pic of another global school teacher, Alisa McCollum. 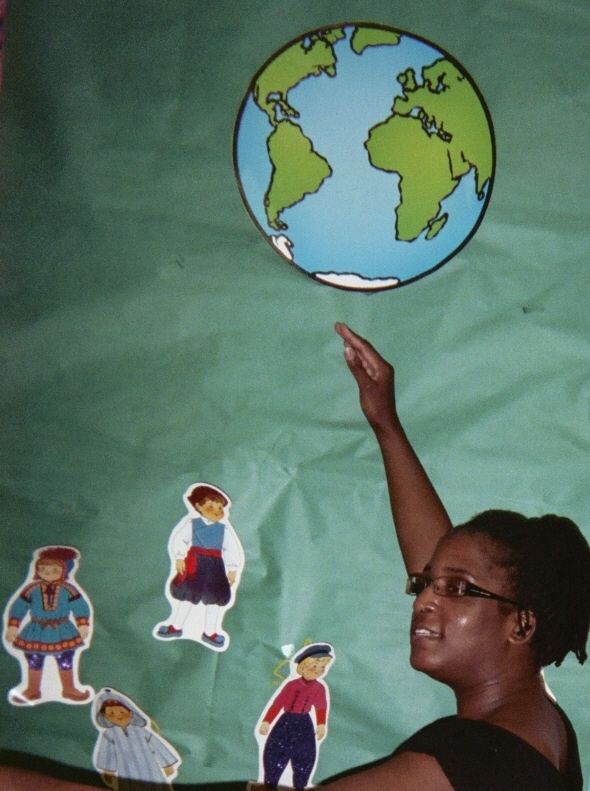 Alisa, a fourth grade teacher, is pointing to where she has traveled to enrich her life and her teaching. The world really is at our fingertips in this information age. Teachers today benefit from learning about the global community as we are challenged with preparing children to be part of it.